OK...I think I understand now...so we'll try to identify and match up two bows at WTT for this test...one that is a "pronounced recurve that stores a lot of energy" (with wide, massive outer limbs) and compare it to a "very efficient bow which doesn't store as much energy (a modest r/d bow with very tiny outer limbs)" using a range of arrow weights such as 8 gpp, 10 gpp, 12 gpp, 14 gpp, and 16 gpp if we can weight the arrows up that much. I think the two bows need to have the same draw weight at the same draw length in order to keep those variables constant. That way the test will isolate stored energy vs. efficiency. Cool...thanks for the recommendation. I've heard this suggestion before at one of the primitive sites...probably the flight shooting area at Yuku. If they are 50# bows, that will be arrows weighing 400 gr (8 gpp), 500 gr (10 gpp), 600 gr (12 gpp), 700 gr (14 gpp), and 800 gr (16 gpp). We might have to duct tape some heavy chit to the big ones...lol. I'm not sure I'd have a problem with bows of reasonably different draw weight, say in range of 50# to 60# as long as the gpp are the same. Similarly the power stroke should be similar but not necessarily the same, say 20" to 22". As long as the bows are shot with the same draw with each successively heavier arrow it should be a valid test. What we're about is testing the rate of change in speed for each bow individually, so consistancy within the testing for each bow is what's important, not so much across each bow. Then we'll compare the two rates of change. I say we, but it's really ya'll which I appretiate enormously, in this context and in general terms. Although I'd be happy to plot the raw data and put up the graph. And I'd be curious if other folks think this has any value, or what they'd like to see done. When comparing two bows, the bow which shoots 6 gpp faster will shoot 16 gpp faster. Further, to be relevant to our purposes, a bow which shoots 8 gpp faster will shoot 12 gpp faster. Good hypothesis. It is impossible to prove, but easy to disprove. All you need is one which doesn't shoot faster with a heavier arrow. I'm assuming your goal is to disprove the theory? My 2 cents is that most bows will follow the hypothesis, but only a few will prove it false. Therefore, if you pick any 2 bows at random, it may or may not disprove your point. I think you'd be better off picking 2 bows after you see their 9 & 10 GPP speeds. Think of it as a pre-qualifier. BK my interest lies more in examining how design influences performance, than it does in disproving a theory. Knowing at what range of arrow mass stored energy "counts" more than efficiency would, conceivably, guide our hand as we entertain new designs. If the range is outside what folks typcially shoot for example, folks who want more speed (with a qualified who doesn't, all else being equal) should, for example, simply focus on storing energy, or visa versa. But you make a good point. Surveying the population of bows build with purpose to maximize speed might not yield the same insight as might comparing more dissimilar bows/designs. interesting stuff here guys.... Steve, corect me if i'm wrong, but are we not talking about the mass weight of the limb tips themselves? on these two bows you discribed the one shooting 176 at 10 ggp has more mass in the outer limb and more working limb which makes it easier to cast a heavier arrow, but the mass of the limb is approaching dry fire speed, or max speed with the lighter shafts. 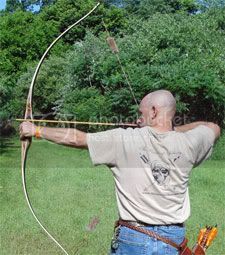 The lighter 58 inch bow, with shorter working limbs and narrow tips and less mass in the outer limb is moving forward much faster.It is slowed up by the heavier arrows so it doesn't produce the speeds. but using light shafts its not held back from shooting much faster before reaching its dry fire speed, or max speed. do i have this right bro? I'm thinking the perfect combo would be a narrow limb with a very stiff tip with low mass weight, enough RD to store max energy, a short working limb with good vertical stability, and enough preload to flip a small truck over. i'm working on something like that right now. ... hopefully it will be done before WTT. Kirk you've reminded me about dry fire speed, and conversion of momentum as it relates to the turkish flight bow for example. Seems like you can have both heavy limbs and high energy storage for shooting light arrows fast, if you have enough gear ratio. And I'm guessing they would not suffer the degradation of speed as you up the arrrow mass as would a tiny limbed bow with lower energy storage. Then you look at the English Longbow model, which could not be more expressly built to minimize outer limb mass (notwithstanding the stylized horn nocks we see from the Victorian era), and it's reputation for casting heavy arrows. it's exactly backwards of what you'd expect. I think BK may have put his finger on it, you can't reallly prove anything with such a generalization. you have a good point on the gear ratio thing David. Avcase, badger, and OL were discussing that in a thread on paleo planet while building "Air Bows". Jimmy posted a link to the thread on my pre load calcs thread the other day. interesting stuff they had going there. one of these days i need to meet this guy. He's here in Portland from what Badger says. David, not long ago we tested a turkish style flight bow to see what it would do at 10 grains per pound. Just one example does not say much but it appears to be a well made specimen. 172 fps was the speed. I did not test it with light arrows but I have a feeling it would be decent. 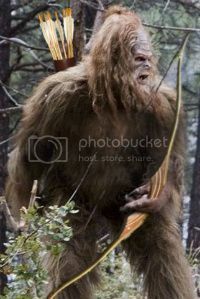 I think th length was around 42'.I considered the 172 to be very good for such a short bow.